The arrival of spring is cause for sighs of relief across the United States. People aren’t only relieved to be done with chilly weather though. Winter weather brings with it treacherous driving conditions and people in many cities don’t cope well to this dangerous change on the roads. It’s safe to say that Jersey City may be the most relieved of all, as it was ranked the worst city for winter driving in the US. The statistic was found by compiling data on how many days per year it snows, the average annual snowfall, the average commute time, the number of snow plows per 1000 miles of road and years between insurance claims. Interestingly, the city has the most snow plows and is, therefore, the most prepared on a city-level for winter weather, but still performs the worst when the snow and ice hit. Winter weather obviously can affect the safety of automobile travel, but it can have other negative effects as well. Inclement weather can have a huge effect on the economy. Longer commute times can lead to a loss of productivity that typically results in a reduction of economic output and consumer activity is typically suppressed (for most industries) during times of extreme weather. As a result, businesses often see an extreme drop in sales and revenue. Jersey City not only came out as the worst overall but has the most negatively affected commute times out of all the other cities studied. Commute times could increase by over 14 minutes when a storm hits, surely resulting in major losses of productivity. 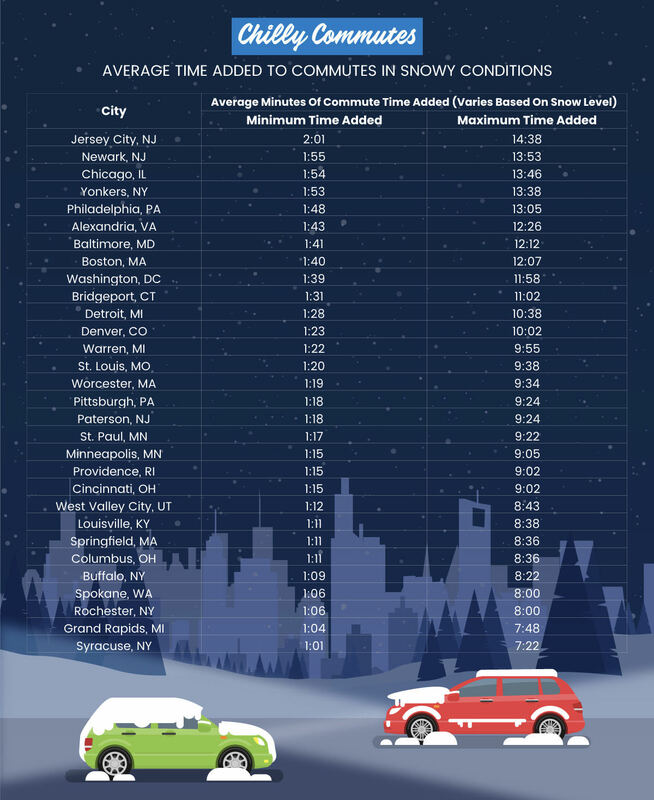 The city not only had the longest potential commute time increase but the longest commute time overall during heavy snowfall. Jersey City was followed closely by another New Jersey city (Newark) as well as Chicago, Yonkers and Philadelphia. 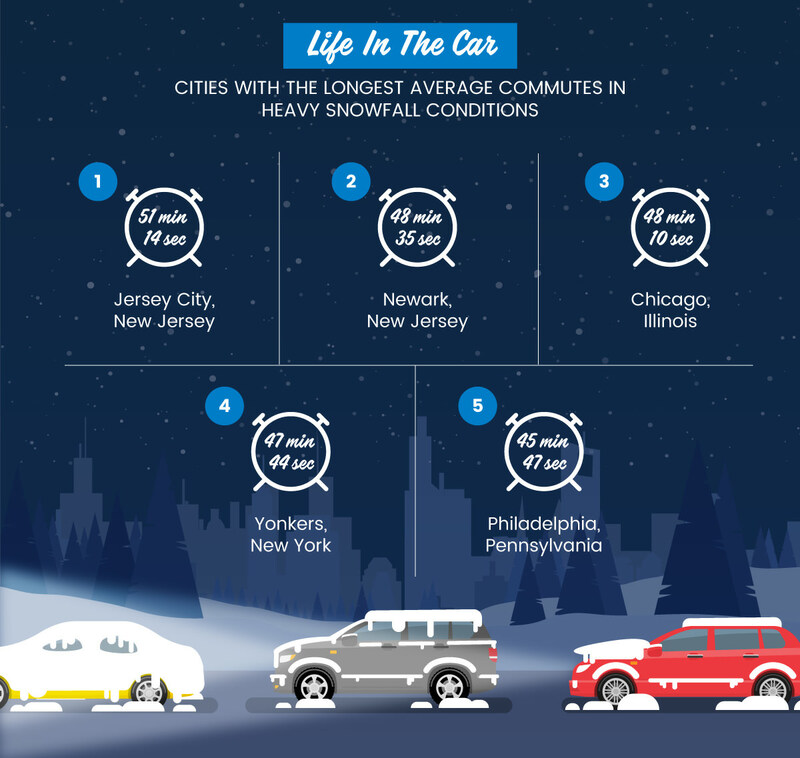 All five cities had average commute times in the snow of over 45 minutes. Winter weather affects people’s mobility both in terms of safety and the time it takes to get places. It’s fair to say that as spring approaches, while a select few will miss the colder weather, most will be happy to bid winter (and driving in its aftermath) goodbye.